The project management add-on allows you to use collaborative tools to help track your projects. In a project entry list, these tools are presented as tabs. For ease-of-use, the last tab saved displayed - you always come back to where you left off. The first tab allows you to exchange comments with your team members or invite and share comments with others who are external to the project. You can add tasks and reminders to your projects. Often this is essential, for example, in light of event preparation. Of course, you can find a summary on your dashboard of upcoming events within or based on certain projects. 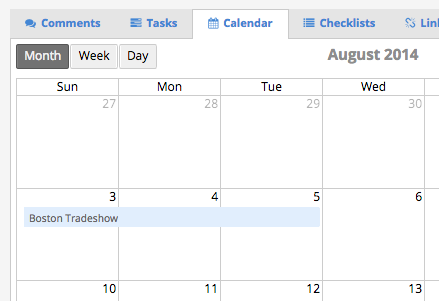 Similarly, you'll find a Sellsy shared calendar, in the context of your project. This is an essential tool for scheduling your actions. The checklists are a powerful tool for managing to-do lists. When you create a checklist, a progress bar indicates the level of completion for the current checklist. You can link objects from Sellsy opportunities, like business records or support tickets. This handy feature allows you to centralize all of the shares in the project. Time tracking integrates with project management. You can easily log time spent on your projects. All Necessary files for your project can be stored directly within folders and subfolders. Anyone involved in the project will have live access to all files in the right spot.